Freeze-casting, also known as ice-templating, is an environmentally friendly materials processing technique that can be utilized to create a diverse array of materials. As a result of the large range of materials (ceramics, metals, polymers, composites), in addition to the range of pore shapes and sizes that are attainable using the freeze-casting technique, applications for freeze-cast materials are numerous. In recent years, the technique has been investigated as a prossessing route for applications that include: structural materials , cocoa tablets , fuel cell electrodes , biomaterials [4-6], dye-sensitized solar cell electrodes [7,8], pharmaceuticals [9,10], stretchable circuits , and lithium ion battery electrodes ; just to name a few! As a result of the broad aplicability of the technique, freeze-casting has gained a considerable amount of attention over the past decade (Fig. 1). Fig. 1. Number of freeze-casting papers published in peer-reviewed journals FY2001 to 2016. Freeze-casting was first used as a materials processing technique by NASA in 1954 . The original work consisted of bulk freezing aqueous particle suspensions. After freezing, ice removal, and sintering, near net-shaped refractory materials were obtained (Fig. 2). Then, in the late 1970's freeze-casting was used in the food processing industry to produce imitation meat . It wasn't until the early 2000's that materials scientists rediscovered it [15-17], this time, assigning ice the additional role of inducing particle assembly to form walls surrounding elongated, aligned pores. The basic procedure is still very simple, the only major change being the induction of a temperature gradient during freezing. Fig. 2. Freeze-cast turbocharger blade. Extracted from: Maxwell, W.G., RS; Francisco, AC, Preliminary investigation of the'freeze-casting'method for forming refractory powders. 1954. The freeze-casting process can generally be described in terms of four main steps. As depicted in Fig. 3, particles are first dispersed in a fluid and the resulting suspension is frozen. When directional freezing techniques are employed, a temperature gradient is induced by placing the suspension on a cold plate. Ice nucleates preferentially at the cold surface and colonies of ice dendrites, oriented perpendicular to the freezing substrate and parallel to each other, propagate along the direction imposed by the temperture gradient. As ice dendrites advance, particles are rejected from the moving front, forming a region of accumulated particles ahead of the interface. As solidification progresses, ice dendrites break through the accumulation region and particles are forced to concentrate within the spaced between the ice dendrites. Fig. 3. Freeze-casting processing steps. An aqueous suspension of particles (a) is placed onto a cold plate; ice crystals propagate in the direction of the temperature gradient, while pushing particles away from the moving freeze front (b). A region of accumulated particles develops ahead of the freeze front and particles are forced to assemble inbetween the ice crystals (c). After complete solidification (d), ice crystals are removed via freeze-dring (e). Lastly, the particle scaffold is heat-treated to densify particle-packed walls (f). Freeze-casting processing steps. An aqueous suspension of particles (a) is placed onto a cold plate; ice crystals propagate in the direction of the temperature gradient, while pushing particles away from the moving freeze front (b). A region of accumulated particles develops ahead of the freeze front and particles are forced to assemble inbetween the ice crystals (c). After complete solidification (d), ice crystals are removed via freeze-dring (e). Lastly, the particle scaffold is heat-treated to densify particle-packed walls (f). Although aqueous suspensions are most commonly used, it's important to note suspensions may also be non-aqueous. Indeed, since the morphology of the frozen fluid templates the pore structure in resulting materials, the range of fluids that may be employed offers much diversity in terms of attainable pore structures. Camphene has been used extensively and results in highly dendritic pore structures [18,19]. Dendrite to rod-ike structures can be obtained by adjsuting the naphthalene-camphor ratio from hypo- to hypereutectic . Tertiary-butyl alcohol has been employed to obtain long pore channels parallel to the freezing direction . Although the terms are often used interchangeably, when non-aqueous suspensions are used, the technically-correct term for the method is "freeze-casting," as opposed to "ice-templating." The microstructural characteristics of freeze-cast materials are largely determined by the "morphology," or the shape, of the frozen fluid, which depends largely on the nature of the interactions between particles within the suspension and the solid/liquid interface. As a result of complex, interdependent relationships in the freeze-casting process, material properties can vary widely even within seemingly similar systems, making predictive control difficult. A sound theoretical understanding is necessary to gain predictive control. Fig. 4. Depending on the speed of the freezing front, particle size and solids loading there are three possible morphological outcomes: (a) planar front where all particles are pushed ahead of the ice, (b) lamellar/cellular front where ice crystals template particles or (c) particles are engulfed producing no ordering. Figure and figure caption reprinted without modification under CC BY 4.0. Experimentally, it has been shown that particles are rejected by the advancing interface if the velocity of the interface is below a critical value; above this value, particles are engulfed [22,23]. 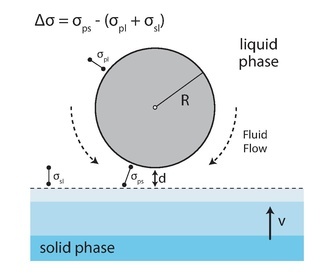 For freeze-casting, the velocity of the solidification interface must be kept below the so-called “critical velocity” such that particles are first pushed by the interface and may later self-assemble within interdendritic space (Fig. 4). Theoretical models attempt to predict critical velocity by balancing the forces exercised on a particle within the vicinity of the solid/liquid interface [24-30]. Numerous possible forces are considered, though the combination of forces included in any given model varies (Fig. 5). These include: forces resulting from molecular interactions between a particle and the solid/liquid interface (e.g. van der Waals, or disjoining pressure, and interfacial ), forces exercised on the particle by the liquid medium (viscous drag ; buoyancy [34, 35]); Brownian [36, 37] and convective forces [38, 39] are also sometimes considered. Additional considerations include heat diffusivity  and latent heat . For some systems, thermal conductivity mismatches between the solid and liquid induce interface shape distortions [42, 43]. In these systems, the effect is so strong that entire models have been built on this consideration alone . However, it has been shown that even in systems where conductivity mismatch behavior seems to dominate the system, it merely complicates it. At the instant before a particle is rejected/engulfed by the interface, it is the magnitude of the attractive and repulsive forces that are determinant . Fig. 5. Schematic of a particle within the liquid phase interacting with an oncoming solidification front. In very dilute suspensions, critical velocity can be estimated fairly well using theoretical models. However, in suspensions containing higher particle fractions, critical velocity cannot be determined based on discrete treatments of force magnitudes alone, because the solidification velocity fluctuates in response to transient thermal gradient shifts , associated with varying local particle fractions. Indeed, as observed experimentally in ice-templating systems , global and local instabilities during solidification correspond to sudden interface jumps which are associated with decreases in local concentration and temperature. For ice-templating systems, theoretical models serve as a starting point in estimating an appropriate solidification velocity, but experimental verification is always necessary. Chino et al. found a solidification velocity of 2 to 12 µm/s was sufficiently slow to allow particle pushing of 45 µm titanium particles, but within the same velocity range, titanium particles of 125 µm were engulfed . Ice-templating models that attempt to tackle multiple particle interactions employ the “Colloids as Big Atoms” approach , wherein colloid particles are taken as atoms that can be directly observed in real space. Nevertheless, due to the inherent complexity of the system, computational models contain inevitable simplifications, making a priori predictions impossible. The basic principles of freezecasting rely on the induction and exploitation of non-equilibrated behavior for the formation of desired microstructures. However, attempts to model the system out of equilibrium with a nonplanar interface are extremely complex. It should also be noted that very few models consider commonly employed nanometric particles; those that do suggest increased fluctuations in the thermal gradient inconsistent with previous models [37, 48, 49]. Chino, Y.D., David C, Directionally freeze-cast titanium foam with aligned, elongated pores. Acta Materialia, 2008. 56(1): p. 105-113. Nguyen, P.T.N.U., Joachim, Fast dispersible cocoa tablets: A case study of freeze-casting applied to foods. Chemical Engineering & Technology, 2014. 37(8): p. 1376-1382. Moon, J.W.H., H. J.; Awano, M.; Maeda, K., Preparation of nio-ysz tubular support with radially aligned pore channels. Materials Letters, 2003. 57(8): p. 1428-1434. Deville, S., Freeze-casting of porous biomaterials: Structure, properties and opportunities. Materials, 2010. 3(3): p. 1913-1927. Fu, Q.R., Mohamed N.; Dogan, Fatih; Bal, B. Sonny, Freeze casting of porous hydroxyapatite scaffolds. I. Processing and general microstructure. Journal of Biomedical Materials Research Part B-Applied Biomaterials, 2008. 86B(1): p. 125-135. Fu, Q.R., Mohamed N.; Dogan, Fatih; Bal, B. Sonny, Freeze casting of porous hydroxyapatite scaffolds. Ii. Sintering, microstructure, and mechanical behavior. Journal of Biomedical Materials Research Part B-Applied Biomaterials, 2008. 86B(2): p. 514-522. Ren, L.Z., Yu-Ping; Jiang, Dongliang, Preparation of porous tio2 by a novel freeze casting. Ceramics International, 2009. 35(3): p. 1267-1270. Wang, X., et al., Ordered porous tio 2 films obtained by freezing and the application in dye sensitized solar cells. Current Applied Physics, 2015. 15(5): p. 662-668. Szepes, A.U., Joachim; Farkas, Zsuzsanna; Kovacs, Jozsef; Szabo-Revesz, Piroska, Freeze-casting technique in the development of solid drug delivery systems. Chemical Engineering and Processing, 2007. 46(3): p. 230-238. Witte, A.U., Joachim, An alternative technology to form tablets. Chemical Engineering & Technology, 2010. 33(5): p. 757-761. Fassler, A.M., Carmel, 3d structures of liquid-phase gain alloy embedded in PDMS with freeze casting. Lab on a Chip, 2013. 13(22): p. 4442-4450. Huang, Y.W., Dongqing; Jiang, Jianzhong; Mai, Yiyong; Zhang, Fan; Pan, Hao; Feng, Xinliang, Highly oriented macroporous graphene hybrid monoliths for lithium ion battery electrodes with ultrahigh capacity and rate capability. Nano Energy, 2015. 12: p. 287-295. Maxwell, W.G., RS; Francisco, AC, Preliminary investigation of the'freeze-casting'method for forming refractory powders. 1954. Kim, Myung, Lugay, Castro, Fibrous protein materials, United States Patent No. 4,001,459, Washington, DC: U.S. Patent and Trademark Office. Jan. 4, 1977. Madihally, Matthew, W.T., Porous chitosan scaffolds for tissue engineering. Biomaterials, 1999. 20: p. 1133-1142. Schoof, H., Fischer, A., Heschel, I., Rau, G. Dendritic ice morphology in unidirectionally solidified collagen suspensions. Journal of Crystal Growth, 2000. 209: p. 122-129. Fukasawa, T., Ando, M., Ohji, T., Kanzaki, S. Synthesis of porous ceramics with complex pore structure by freeze-dry processing. J. Am. Ceram. Soc, 2001. 84: p. 230-232. Araki, K.H., J. W., Room-temperature freeze casting for ceramics with nonaqueous sublimable vehicles in the naphthalene-camphor eutectic system. Journal of the American Ceramic Society, 2004. 87(11): p. 2014-2019. Araki, K.H., J. W., New freeze-casting technique for ceramics with sublimable vehicles. Journal of the American Ceramic Society, 2004. 87(10): p. 1859-1863. Oh, S.-T.D.K., Young; Suk, Myung-Jin, Freeze drying for porous mo with different sublimable vehicle compositions in the camphor-naphthalene system. Materials Letters, 2015. 139: p. 268-270. Choi, H.-J.L., Joo-Hyeok; Yoon, Seog-Young; Kim, Byung-Kyu; Park, Hong-Chae, The microstructure and properties of porous alumina/zirconia composites fabricated by a tbabased freeze casting route. Journal of Ceramic Processing Research, 2012. 13(6): p. 762-766. Corte, A.E., Vertical migration of particles in front of a moving freezing plane. Journal of Geophysical Research, 1962. 67(3): p. 1085-1090. Uhlmann, D.R.C., B.; Jackson, K. A., Interaction between particles + solid-liquid interface. Journal of Applied Physics, 1964. 35(10): p. 2986-&. Hadji, L., Asymptotic analysis of particle engulfmemt. Physical Review E, 1999. 60(5): p.6180. Kim, J. and P. Rohatgi, An analytical solution of the critical interface velocity for the encapturing of insoluble particles by a moving solid/liquid interface. Metallurgical and Materials Transactions A, 1998. 29(1): p. 351-358. Rempel, A.W.W., M. G., The interaction between a particle and an advancing solidification front. Journal of Crystal Growth, 1999. 205(3): p. 427-440. Rempel, A.W.W., M. G., Particle trapping at an advancing solidification front with interfacial-curvature effects. Journal of Crystal Growth, 2001. 223(3): p. 420-432. Shangguan, D., S. Ahuja, and D. Stefanescu, An analytical model for the interaction between an insoluble particle and an advancing solid/liquid interface. Metallurgical Transactions A, 1992. 23(2): p. 669-680. Shangguan, D.A., S.; Stefanescu, D. M., An analytical model for the interaction between an insoluble particle and an advancing solid liquid interface. Metallurgical Transactions a-Physical Metallurgy and Materials Science, 1992. 23(2): p. 669-680. Catalina, A.V., S. Mukherjee, and D. Stefanescu, A dynamic model for the interaction between a solid particle and an advancing solid/liquid interface. Metallurgical and Materials Transactions A, 2000. 31(10): p. 2559-2568. Juretzko, F.R., et al., Particle engulfment and pushing by solidifying interfaces: Part 1. Ground experiments. Metallurgical and Materials Transactions A, 1998. 29(6): p. 1691-1696. Chernov, A., D. Temkin, and A. Mel’nikova, The influence of the thermal conductivity of a macroparticle on its capture by a crystal growing from a melt. Sov. Phys. Crystallogr, 1977. 22(6): p. 656-658. Bolling, G.F.C., J., Theory for interaction of particles with a solidifying front. Journal of Crystal Growth, 1971. 10(1): p. 56. Stefanescu, D.M., et al., The influence of buoyant forces and volume fraction of particles on the particle pushing/entrapment transition during directional solidification of al/sic and al/graphite composites. Metallurgical Transactions A, 1990. 21(1): p. 231-239. Chen, M.-W., B. Wang, and Z.-D. Wang, Effect of buoyancy-driven convection on steady state dendritic growth in a binary alloy. Chinese Physics B, 2013. 22(11). Happel, J. and H. Brenner, Low reynolds number hydrodynamics: With special applications to particulate media. Vol. 1. 2012: Springer Science & Business Media. Xu, J., et al., Theoretical study and pathways for nanoparticle capture during solidification of metal melt. Journal of Physics: Condensed Matter, 2012. 24(25): p. 255304. Mukherjee, S., M. Sharif, and D. Stefanescu, Liquid convection effects on the pushingengulfment transition of insoluble particles by a solidifying interface: Part ii. Numerical calculation of drag and lift forces on a particle in parabolic shear flow. Metallurgical and Materials Transactions A, 2004. 35(2): p. 623-629. Mukherjee, S. and D.M. Stefanescu, Liquid convection effects on the pushing-engulfment transition of insoluble particles by a solidifying interface: Part i. Analytical calculation of the lift forces. Metallurgical and Materials Transactions a-Physical Metallurgy and Materials Science, 2004. 35A(2): p. 613-621. Asthana, R. and S. Tewari, The engulfment of foreign particles by a freezing interface. Journal of materials science, 1993. 28(20): p. 5414-5425. Sen, S.K., W. F.; Curreri, P.; Stefanescu, D. M., Dynamics of solid/liquid interface shape evolution near an insoluble particle - an x-ray transmission microscopy investigation. Metallurgical and Materials Transactions a-Physical Metallurgy and Materials Science, 1997. 28(10): p. 2129-2135. Hadji, L., Thermal force induced by the presence of a particle near a solidifying interface. Physical Review E, 2001. 64(5): p. 051502. Hadji, L., Axisymmetric shapes and forces resulting from the interaction of a particle with a solidifying interface. Physical Review E, 2002. 66(4). Zubko, A., V. Lobanov, and V.V. Nikonova, Reaction of foreign particles with a crystallization front. Sov. Phys. Crystallogr., 1973. 18(2): p. 239-241. Stefanescu, D., et al., Particle engulfment and pushing by solidifying interfaces: Part ii. Microgravity experiments and theoretical analysis. Metallurgical and Materials Transactions A, 1998. 29(6): p. 1697-1706. Deville, S.M., Eric; Bernard-Granger, Guillaume; Lasalle, Audrey; Bogner, Agnes; Gauthier, Catherine; Leloup, Jerome; Guizard, Christian, Metastable and unstable cellular solidification of colloidal suspensions. Nature Materials, 2009. 8(12): p. 966-972. Lasalle, A.G., Christian; Maire, Eric; Adrien, Jerome; Deville, Sylvain, Particle redistribution and structural defect development during ice templating. Acta Materialia, 2012. 60(11): p. 4594-4603. El Hasadi, Y. and J. Khodadadi, Numerical simulation of the solidification process of nanofluids. El Hasadi, Y.M.F.K., J. M., Numerical simulation of the effect of the size of suspensions on the solidification process of nanoparticle-enhanced phase change materials. Journal of Heat Transfer-Transactions of the Asme, 2013. 135(5).